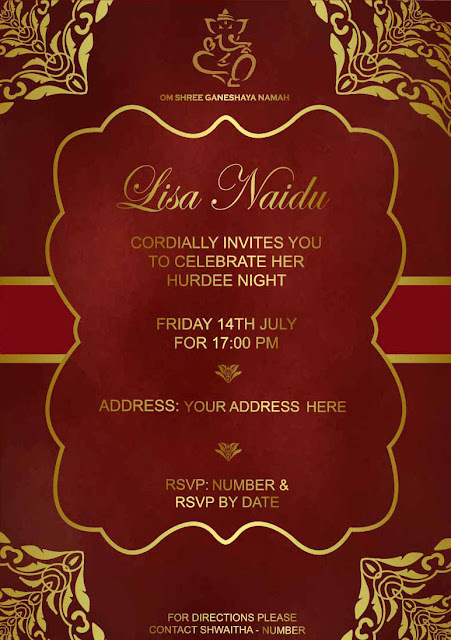 A Hurdee ceremony invitation designed for a customer. The customers wedding colours where Red and gold. What is a Hurdee ceremony - Hurdee is a pre-wedding ceremony whereby the bride has a paste of tumeric powder rubbed all over her body by loved ones. This gives the bride a glow, ward off evil spirits from affecting the bride and the groom, its colour ushers in a life of prosperity for the couple, who are starting off their new life together, its medicinal properties as well as being antiseptic, an application of this ingredient before marriage would ensure that the bride and groom are blessed with blemish-free skin. It also ensures that the couple is protected against any cuts, bruises or ailments before the wedding, it also purifies and cleanses the body. It is known as an effective exfoliating agent and it is also known to alleviate some of the nervousness that the bride and the groom feel. This ceremony is also accompanied by traditional songs and dances at times.